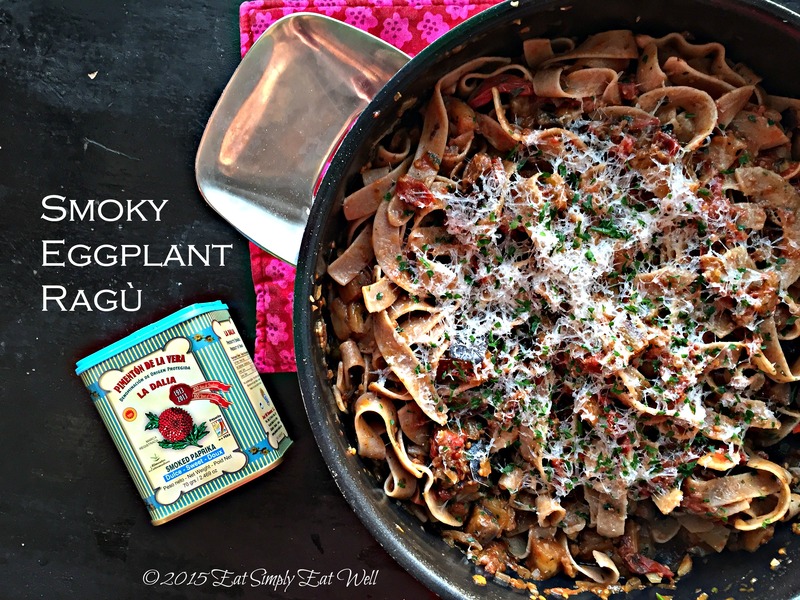 Smoky Eggplant Ragù and thoughts on 2016 goals - Eat Simply, Eat Well Love the idea of ragu, but looking to eat less meat? With this eggplant ragu, you're only regret will be that you didn't double the batch the first time. It’s a funny thing, the start of the New Year. There’s something about seeing the calendar shift forward by one number – 2015 to 2016 – that causes many of us to pause and take stock of our lives. What did we accomplish over the last 12 months? Where? With whom? Are we satisfied? What’s next? I’ve had several friends ask if I’ve made New Year’s resolutions for 2016 and you know – I haven’t. But I have set goals for myself – goals I can track and measure. Resolutions are not goals, I feel, because so often they are vague: “drink less coffee”; “lose weight”; “exercise more”; “make more money”; “travel”; “get up earlier”; “reduce sugar intake”. But these don’t really give a way to know if you’ve succeeded – or not. Goals are stronger and more specific (or should in order to be effective). They are measurable. They have a time frame attached. I’m starting to sound like an ad for SMART goals which are defined as Specific, Measurable, Achievable, Realistic, Time-bound. I agree with most of that – except the “realistic” part. What does that mean, really? Realistic for whom? Compared to what/when? Sometimes I think that in an aim to be realistic, we restrict ourselves to accomplishing what we already are certain we are capable of. It’s setting the bar too low. What if, this time, you set a goal for yourself that you honestly aren’t sure you can do? It needs to be something that you really truly want to make happen. Make your goal bigger than you are right now. Make it a little crazy. Force yourself to push – a lot – in order to get there. And stop listening to the voices – in your head or from people in your life – that say you can’t, or that you should play smaller, safer. Maybe you’ve completed a half-marathon and you aim for a Olympic triathlon. Or you’ve done that triathlon, so it’s Half Ironman this time. To do this, you’ll need a good training plan – maybe even professional help. Or maybe you’ve thought about “losing a few pounds” – what if, instead, you, decide to go sugar-free for 30 days, and you track your weight at the beginning and then every 7 days. (or go all-in like my friend Kaisa, and go sugar-free for 365 days!) Buddy up with a friend – and check in regularly for accountability and support. For most of us, quitting sugar is hard – we don’t even always know how much we are consuming, so making the commitment means we need to pay more attention. Maybe you’ve dreamed for years about owning your own business but you’ve had trouble seeing how you’ll ever make enough cash to quit your day job. Make a goal of landing 2 clients by June 2016 (or why not March 2016?). Make it a hard-line goal – it’ll force you to make a plan to get there. Maybe you, like me, have a blog and want to make it better, more consistent, attract more readers. Make a commitment to blog every day for 30 days. Hold yourself to it. If you miss a day, you start back again at day 1. Or, ask a friend to hold you accountable: if you miss a day, not only do you start back at day 1; you also owe that friend $100 – or an amount that is sufficiently painful that you’d hate to hand it over – but they’d be delighted to get. It’ll motivate you when you’re tempted to put off the work. Because here’s the deal. Time is one currency you can never earn back. The clock ticks forward whether we are scrolling Facebook or writing a novel; whether we oversleep in the morning or get up for 60 minutes of yoga before work; whether we ask for the sale or hide at our desks to perfect our pitch just one more time. Whether we start right now, or tell ourselves “not yet”. It’s unlikely you’ll ever feel like you have too much time on your hands and not enough things to do – I felt bored once back in Junior High School, but since then…mostly it’s trying to figure out how to fit everything in and making decisions on what’s really important – for me. It may be similar for you. Make this the year that you step forward into that great life you want, but pushing yourself to be bigger and better than you fully know you can be. You’ll surprise yourself. You’ll make progress. You may even inspire a few people. You’ll definitely inspire yourself to continue to improve, and what could be better than that? There’s one major difference between the people who become what they want to be and those who don’t: Discipline. The greatest natural gifts in the world don’t help. Massive amounts of money of invested cash don’t either. It’s getting up every morning with a plan and deciding you’re going to make it happen. Oh – and that “time” thing? We all have 168 hours – every single week. You, me, President Obama, Elon Musk, Angelika Merkel (to name a few people who seem to cover more ground in a week than most I know). You have more time than you think. How are you going to use it to get to where you want to go? While you chew on those thoughts, let’s get some good food going that will help fuel through whatever goals you set for yourself. This is a simple dish to make, packed with flavor, and full of plant-based nutrients. It’s feel-good comfort food that you can feel good about eating. The smooth softness of the eggplant pairs well with the sweet-sour acid notes of the roasted tomatoes and the smokiness of the smoked ground paprika. 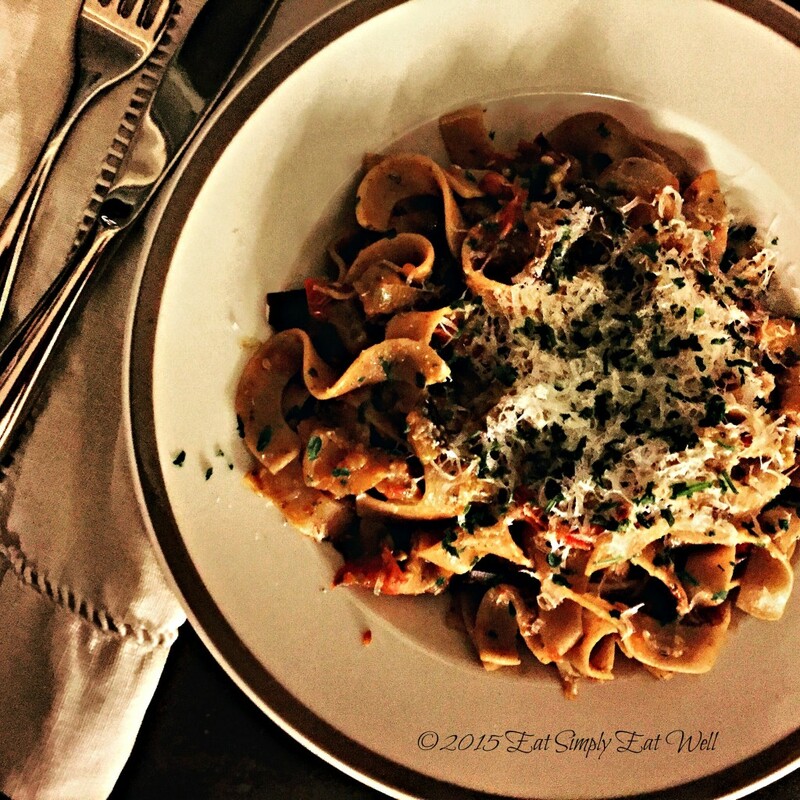 Get ready to add this one to your menu again and again, all Winter long. Preheat oven to 200°C/400°F. Wash the tomatoes and slice them in half. Lay them cut side up on a parchment-lined baking tray. Drizzle with olive oil, sprinkle with salt, pepper and oregano. Roast for 30 minutes, or until soft and slightly blackened around the edges. In a large frying pan, pour in 2-3 tablespoons of olive oil. Add the onion and cook until soft and translucent: 5-8 minutes. Add the garlic and the chili powder, stir to combine, and cook for one minute more. Add the eggplant and stir well to combine. Add 1/2 cup water and place a lid on the pan. Allow the mixture to cook for 7 minutes. Remove lid, add smoked paprika, oven roasted tomatoes, salt, pepper and parsley. Stir well to combine, and then stir occasionally for an additional 5 minutes. Taste; adjust quantities of salt, pepper and chili powder to your preferences. Bring 6 cups/1.5 liters of water to a boil. Add 1 teaspoon of salt and the pasta. Cook the pasta according to the instructions on the package. When the pasta is ready, reserve one cup of the liquid and drain. (Note: I usually drain the pasta into a bowl so that I can use the pasta water for soups – it gives a really nice silky texture). Add the drained pasta and 1/2 cup pasta water to the pan with the sauce. Stir well to combine. If your pasta is too dry, or if you’d like a little more sauce, add the remaining 1/2 cup of pasta water. Did you like this blog post? Share it with your friends on Facebook, Twitter, Instagram, Pinterest. Want to make sure you catch every post? 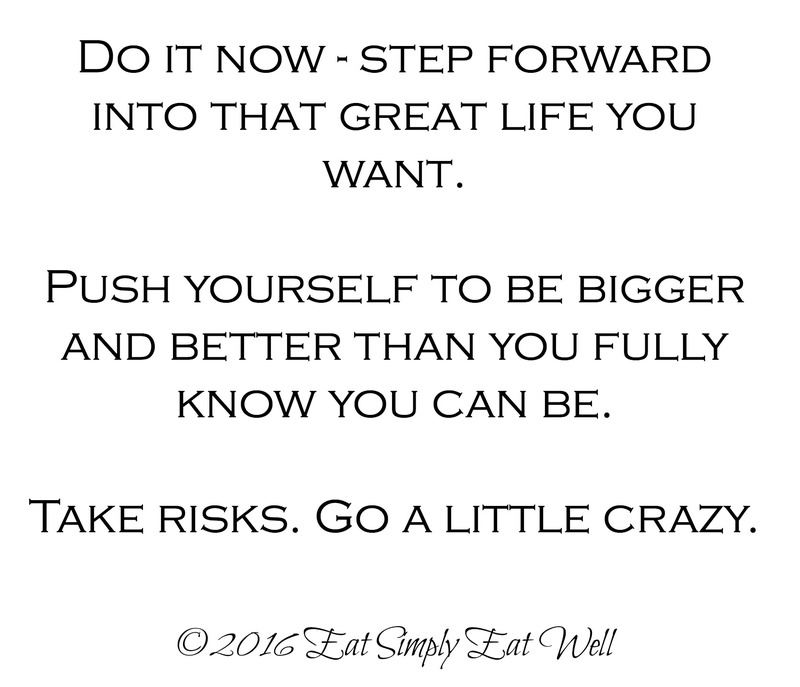 Sign up for the Eat Simply, Eat Well newsletter now!